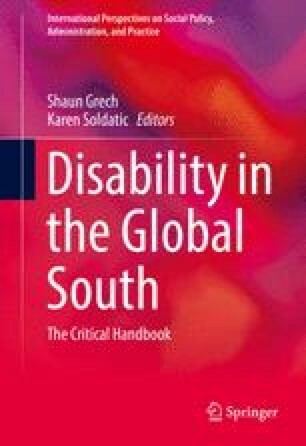 The World Report on Disability (WHO and World Bank 2011) is a significant contribution to developing our knowledge of the life circumstances of disabled people in the developing world. Yet, there remains a paucity of data regarding structural barriers, discrimination, and life experiences of disabled people living in poverty. Exploring these realities means traversing a mosaic of cultural and economic differences, in order to learn not only about material realities, but also the meanings these hold in specific contexts. This chapter provides an exploration of the psychological layer of disability experience in contexts of poverty. As should be clear, it is reasonable to say that we have little material to work with, and our models of analysis have uncertain cross-cultural validity. Therefore this chapter is more a stimulus for discussion than a theoretical proposition.